Boat rides on the river, Ayurvedic massages, etc. 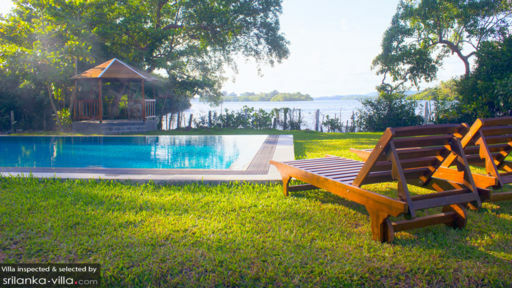 Located on the banks of Koggala river in the picturesque village of Kathaluwa, Sri Lanka, Villa Lumbini Lagoon is a serene, four-bedroom holiday retreat with a tranquility that engulfs its periphery. For a truly relaxing and rejuvenating holiday, this would be the perfect spot for you to spend time in with your loved ones. A swimming pool, Ayurvedic massage, and bus tropical gardens are all part of the villa, a way to immerse yourself in this tropical haven. As you lounge beside the river, observing and cherishing each moment, you will feel a sense of calm and belonging like no other! There are four bedrooms and three bathrooms at the villa, and each villa has been furnished with four-poster, double beds featuring a canopy with sheer, white drapes for an easy sleep. As you relax in the warm-hued bedrooms, which are inviting and homely, you can even enjoy views of the tropical gardens outdoors. The three bathrooms are fitted with toilets and showers. The bedrooms are air-conditioned and have enough wardrobe space for all your belongings. With expansive and sprawling gardens showcasing a variety of plants and trees, the outdoors at Lumbini Lagoon is essentially a tropical paradise. The sounds of the Koggala river can be heard even when you’re basking under the sun beside the private swimming pool. As you take in the splendid ambiance, it goes to show that Sri Lanka’s coast is one that affords a meditative quality to your being. Relax on the sun chairs with a good book and a drink, and bask under the tropical sun as you enjoy the peace and quiet. A traditional gazebo beside the pool is another good spot for lounging and relishing the evening breeze. 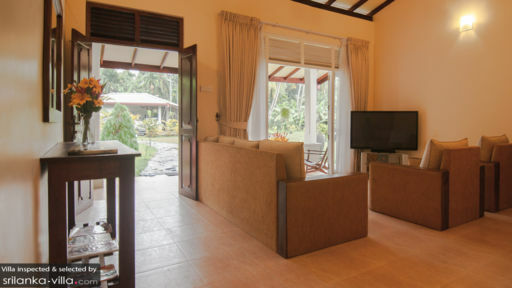 From the front porch which has a few lounge chairs, the cozy living area at Lumbini Lagoon Villa is furnished in a way that provides homely comfort and an inviting ambiance to guests. With comfortable sofas and armchairs, lights that cast a warm shadow on the entire room, and a view of the gardens, the living area is a communal ground for relaxation and rest. A large flat-screen TV and DVD player has been put in place for your entertainment as well. You can choose to dine outdoors, alfresco style, under the stars and with the island breeze blowing around you, or dine indoors in the living area on the round dining table. The kitchen is fully-equipped and fitted with all sorts of amenities and facilities for your ease. Apart from housekeeping, cooking, and cleaning, the services offered in and around the villa are multifold. There are boat rides on the river, Ayurvedic massages, cooking lessons, and much more. Laundry service and meal preparations can also be looked after by the staff itself. Sri Lanka’s Southeastern coast offers a myriad of activities and things to travelers including the historical town of Galle with its European architecture and winding streets. Galle Fort is a UNESCO World Heritage Site and a 'must-visit' for travelers. Unawatuna & Mirissa are two of the bustling beaches of Sri Lanka with their tourist-friendly locations and cast stretches of white sand! Excellent place located within a peaceful atmosphere. 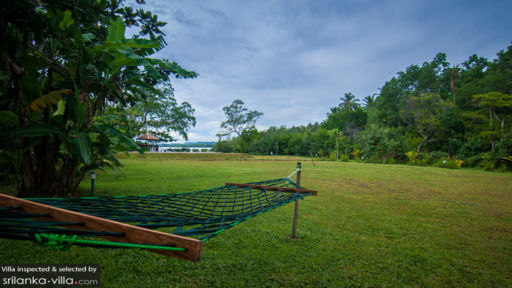 The backyard spans across a wide area that ends with the shore of the Koggala lake and the swimming pool. The bungalow consists of 4 air conditioned rooms with 2 bathrooms, kitchen and the living area. Booze and food (Vegetables, Meat, etc.) has to be brought by the guests and the staff will prepare them as required. Perfect place for a getaway with friends and family. If you are looking for calm surroundings complete with serene views, definitely visit Lumbini Lagoon. The poolside scenery, expansive gardens and mouth watering dishes made our stay as a group of 8 adults and 3 children all the more special. Sisira and Kavin took great care of us during our stay and Kavinda was a knowledgeable host who helped us with any queries prior to our stay. Will definitely be recommending Lumbini Lagoon. We were a party of 8 adults, stayed 4 wonderful days at Lumbini Lagoon and enjoyed every moment. The villa has 4 separate bedrooms, 3 baths, living room and kitchen. Huge garden overlooking the lake. We had breakfast in the gazebo on the lake shore, after a morning swim in the pool. The staff that are resident on the premises looked after us very well, served a great breakfast and when we asked for it also dinner. Much better than staying in one of the hotels on the busy coast road. Mosquitoes are not as bad as you can expect next to the lake, nets over the beds kept them out and lots of citronella candles. We enjoyed the abundant animal life in the garden, including iguanas, birds and monkeys. Try the boat tour on the lake organized by the villa owners, for a visit to an island where cinnamon is grown and produced, and a small Buddhist temple.